Don’t be fooled in thinking Mercedes is trying to pull a fast one, this really is an all-new G-wagen (ok, Mercedes now calls it a G-class but it will always be G-wagen to us.) How “all new” is it? Only six components are carried over from it predecessor. It stands to reason, the, that the familiar styling hides a comprehensive overhaul for the latest Mercedes-Benz G-class, with a vast improvement made to driving dynamics, comfort and technology. Sitting at the top of the range and arriving first for UK customers is the Mercedes-AMG G63. The old G63 made up more than 60 per cent of UK G-class sales, so debuting with the model makes a great deal more sense, though a G350d will be along later for those wishing for less flash and more frugality. The G63 gets the 577bhp variant of AMG’s now familiar hand-built, 4-litre twin-turbocharged V8. The maximum output is developed at 6000rpm and torque of 627lb ft is produced from 2500 to 3500rpm. Mercedes’ nine-speed automatic transmission makes another appearance here under the AMG Speedshift Plus banner and naturally the G63 uses permanent four-wheel drive. The system features locking front, centre and rear differentials, controlled not via fiddly touchscreen controls but by three large and satisfying buttons front and centre on the dashboard. There’s a low-range transfer ’box, too, selected with a button on the centre console while the car is in neutral. A 0-100kph time of 4.5sec gives some idea as to the brutality of the G63’s performance, given the V8 is also having to move two-and-a-half tons. 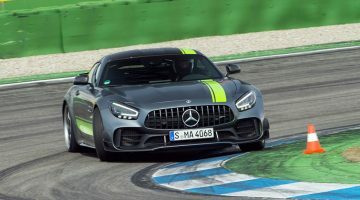 What it cannot convey is the childish glee you’ll get from thundering up through the gears under full throttle, the twin tailpipes exiting from either side of the car genuinely matching AMG’s own GT R for aural drama – that you’re sitting several feet higher than in the supercar makes the experience all the more astonishing. 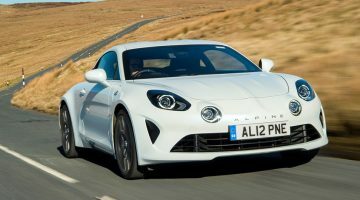 Gearshifts aren’t race-car snappy, but the paddles respond quickly enough to be useful, and the huge torque on offer means you’ll rarely be stuck in an inappropriate gear. Economy and emissions both look fairly tragic – 13.2 L/100km combined and 299g/km of CO2 – though we suspect few owners will care. Visually similar, the latest G is, nevertheless, very different to its predecessor under the skin. You still get a ladder-frame chassis, but the suspension attached to it is all new. At the front are a pair of double wishbones mounted to the frame in place of the old live axle, while the rear suspension is still a live axle, albeit controlled with four trailing arms per side and a Panhard rod. The steering is now rack-and-pinion rather than recirculating ball, and the body sat atop the frame is lighter and stronger than before, formed from steel and clad in aluminium wings and doors, with an aluminium bonnet and tailgate. The net saving is around 170kg overall, though the G63 still comes in at 2560kg – not far short of a long-wheelbase hybrid Range Rover. The new styling hides some physical growth, too, most significantly in width – at 1931mm it’s 64mm wider than before, and its 1638mm track is 123mm greater than that of the old car. It’s also 53mm longer and 15mm taller, to the benefit of a cabin more fit for human habitation than the previous model: front passengers get 68mm more elbow room and rear passengers have 150mm extra for their legs. Inside the new G63 is much closer to other Mercedes models, with dual TFT screens, a bank of controls below the central air vents to control the air conditioning (the three switches to control the four-wheel drive system are retained) and Mercedes’ regular trackpad and rotary control for the car’s infotainment system is also present. There’s even the latest S-class derived AMG steering wheel. If it looks like nothing has changed on the surface how the new G drives compared to its predecessor is night and day. The new G is vastly better to drive than its predecessor (the ‘O.G.’? ), loses none of its character and is now worthy of its AMG badge. Before you need to know anything about how it drives you need to know the new G sounds just like the old when you unlock it and pull the door closed behind you. Mercedes’ engineers could have made it S class quiet, but the G is no ordinary Mercedes. The biggest step forward is the steering. What was once terrifying is now quite acceptable, and that’s about as much as you can hope for from a car with the dimensions and mechanical layout of the latest G. Before, you’d get a mix of remoteness, inconsistency and imprecision in the rack, but once through an unresponsive dead zone around the straight-ahead the steering can be used to plot a relatively reliable course from corner to corner. It’ no GT R, but it’s no longer a turn and hope for the best scenario, either. With little feedback you have to build up trust that the G will negotiate the next turn, particularly given the extra brake pressure you need to haul off the considerable speed the hot-vee twin-turbo V8 likes to reach. However, the newfound predictability and relatively early onset of scrubbing and squealing noises from the front axle give decent indication of how much the tyres have left to offer. There’s grip to be found beyond the squeal, and while the G63 will eventually push predictably wide, you can carry impressive pace down a road that has as many turns as it does straights, confident in the V8’s ability to catapult out of the former and along the latter with hot hatch worrying pace, making up any ground you might have lost from your earlier circumspection. 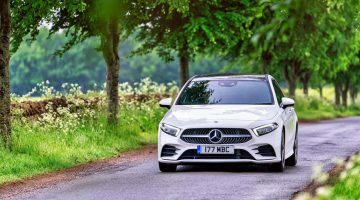 The ride is firm and tends to jiggle over smaller bumps, but the high ground clearance and heavy-duty suspension gives you little doubt that it’s capable of handling surfaces far more severe than you’re likely to encounter on normal roads. The G63 responds less well to harsh inputs, the chassis easily unsettled thanks to its tall stance and heavy kerb weight. You make progress by driving it much like the significantly smaller but similarly proportioned Brabus Smart Fortwo, feeding the steering, brakes and throttle as smoothly as possible to minimise pitch and roll, and to avoid overloading the tyres and rousing the stability control. Slow in, fast out is the best technique, as turning in too quickly will result in an undignified squealing commotion. To its credit the G63 doesn’t roll or pitch excessively, and with a good view through the upright windscreen over the box-like arches you can place it with surprising ease despite its width. Thanks to powered side bolsters you’re held in place in the seats, too, though the feeling of them pinching your ribs is a little disconcerting at first. Cabin ambience as a whole is impressive, with a pleasing mix of Mercedes modernity and traditional G-class right-angles. As a performance car it fits into the tightest of niches that few will understand, but now the G63 is less of an ageing instrument with a colossal rage to control, and much more of useable device in which to enjoy the most unexpected thrill of driving we’ve encountered. It’s certainly a car that tops the guilty pleasure list. A chance to drive a G500 off-road was enough to demonstrate that it’s right at the sharp end in this discipline. Capable of wading up to 700mm deep and with greater approach, break-over and departure angles than before, its capabilities are pretty astonishing. The G63 will be the first new-generation G-class to go on sale in the UK when deliveries begin in July. A G350d will follow at a later date, but the G500 petrol also available to us on the launch (quieter, less dramatic to drive and considerably less brash to behold than the AMG) will not be coming to the UK. G63 pricing starts at $188,500, which is by anyone’s definition quite a lot of money, but no longer seems quite so unreasonable given how much has changed beneath the G’s surface – view it simply as a high-end SUV, akin to Range Rovers, Bentaygas and Cayenne Turbo Ss, and the price begins to make more sense. Objectively all three of those rivals are better to drive, both handling and riding with more composure and doing so more quietly and smoothly than the G63 can muster, but for character the Mercedes is in another league. The old G-class had character, too, but you had to be seriously committed to the cause, so appalling was it to drive. The new one doesn’t carry such an enormous caveat. It should cause some red faces at Land Rover, too. While JLR flounders over the Defender’s replacement, the latest G-class demonstrates that it’s entirely possible to mix the ability and character of an age-old model with the performance and technology required of new cars.